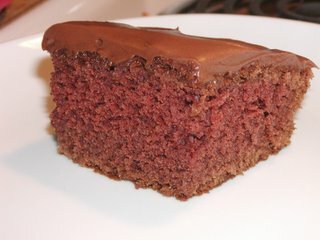 This is another inspiration form a Giada DiLaurauntiis recipe. I happened to have most of the ingredients on hand and decided to give it a try. I changed the recipe a bit, as usual. 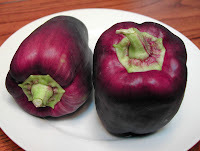 I added in peppers because I had these gorgeous purple peppers that I picked up at a local farm. I had never seen them before and just had to try them! This recipe seemed like the perfect place for them. I also added chic peas to the mix for some added protein! Pour the canned tomatoes into a 3 1/2-quart baking dish and spread to cover the bottom. In a large bowl combine the remaining ingredients (excluding the bread). Toss to coat. Pour the vegetables over the canned tomatoes in an even layer. Cover the baking dish with foil and bake for 35 minutes. 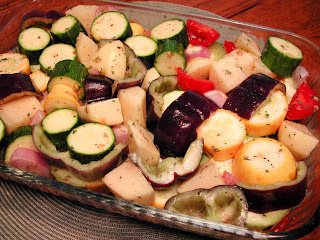 Remove the foil and bake until the edges of the vegetables are golden, about 30 minutes. Serve alone as a side, or over toasted bread for a main dish. This could also be used as a filling for calzones! Just a little mozzarella cheese and ooh la la!! That looks great. 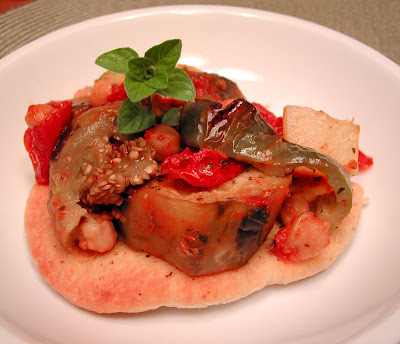 I've bought a few eggplants this summer but I never got around to making caponata, even though I had several recipes bookmarked. I think the season might be ending too. I just grilled some this weekend. I will miss the fresh produce from the summertime. Claire, The peppers tasted like a cross between green and red peppers. They actually looked just like green peppers once they were cooked! I like the mini pizza rounds; they're cute.